We live in a society (at least in the U.S.) that believes children are only loved when they have multitudes of toys. They need to have plenty of variety: fun, educational, building, role playing, video, characters, etc. and all categories in between. When we as parents come to the point where we see no benefit to this excessive amounts of toys and decide to limit them drastically, people think we are purposely causing harm to our children, or we must be poorer than poor and they try to compensate for us by giving our children more. But what I’ve found, and what many others have found, when choosing a more Simplicity Parenting approach, is that children thrive in an environment that has less. “Our studies show that giving children too many toys or toys of the wrong types can actually be doing them harm. They get overwhelmed and cannot concentrate on any one thing long enough to learn from it,” said Lerner. 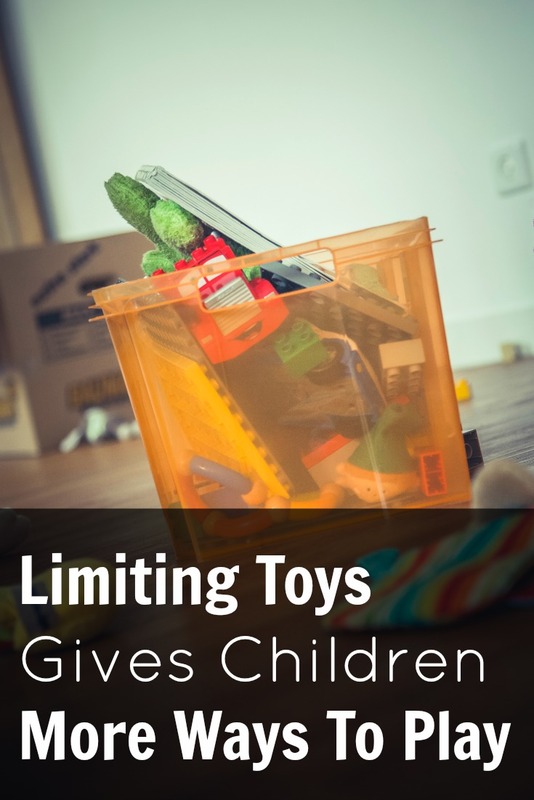 Experts hesitate to put a figure on the number of toys children should have, but many believe two dozen is enough for children of preschool age. Most exclude books from this rule because of research linking reading with improved academic performance and self-esteem. “The more books, the better,” said one. According to Psychologist James Oliver, toys that pre-determine play – and this is especially true of merchandising – offer limited possibilities for fun. So while Buzz Lightyear can only ever be a space ranger, a doll might become a hungry baby, a tea party guest – or a space ranger – depending on the child’s desires. Keeping the toy collection limited can be difficult, especially when others around us feel they need to “bless” the “deprived” children. What do we do?? Start out the conversation with the statement: “I have some fear in telling you this…” then begin with what is on your heart. Emotionally “show up”, feel your feelings, and tell the truth. Take the time to explain your position on gifts and talk about a different way they can bless you, your children and your family. Be open minded and not afraid to share those ideas. Your heart needs to communicate that above all, the gift giver matters to you and their blessing through whatever gift is appreciated. Give them a chance to reflect, feel what they are feeling due to your sharing and stay present with them, willing to walk through their feelings. It’s about relationship, not the stuff. Although you can’t tell your mother what to buy for her granddaughter, you can suggest to her what your daughter needs and wants. Two months before the next gift-giving holiday, let it slip into conversation if your daughter needs or wants specific items like a new bed or new shoes (and what size) or a membership to the local zoo or dance lessons. If she’s computer savvy, create an Amazon wishlist and let her know about it to help her brainstorm gift ideas. You can take a picture of the child using the item, send it off to the giver, thank them again and then donate the gift. You can keep them for “rainy days” or rotate toys regularly, if you would like. But don’t feel obligated to. For many parents, having to manage and organize all the toys takes away from the most important thing that they should be doing: spending time with their children. Just because people give gifts, doesn’t mean you are obligated to keep them. A gift should not have strings attached (if it does, there is probably more than just the issue of gifts that needs to be addressed). Of course we want to express appreciation when someone gives something, but it doesn’t mean those items have to stay in our home. Giving the gifts away doesn’t mean you are disrespecting or ungrateful. You are the one that has to live in your home, you are the only one that needs to be happy with it. People that do not live in the home, have no say. On top of that they both love books so once some of the books have been with my eldest for a year or two, they go to my youngest, and after another year we start to consider giving them away unless the boys absolutely love them. I just wanted to point out that Buzz Light-year was a tea party guest in Toy Story ;]. I’m totally nit-picking, I love your blog and your insight. We always ask for craft sets. The kids have fun making it, i send the recipient a photo, and about a week or two later I throw it away and no one remembers. My two kids have multitude of toys given by my sisters to them as gifts. I don’t usually buy them because I don’t want to store a lot of toys. 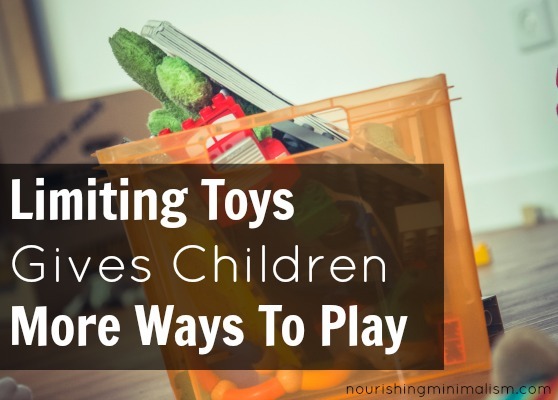 It is an agreement with me and my kids that they can only get new toys when they give their old toys and share it with other deprived children. This way I can limit their toys and give them more ways to play.